Gavin Erwin is a very good mate of mine and we have been fishing together for a long time. Gavin appears in many of our YouTube videos here at Fish The Fly, and is a proud supporter of this initiative. In my opinion, Gavin is one of the best anglers in the Country and a superb all round fly fisherman. He can tie some amazing flies as well. The above is all very good and well, but Gavin’s main passion is painting. He established Fish Art after he left school, and his paintings, sketches and pieces of art are displayed all over the Country. 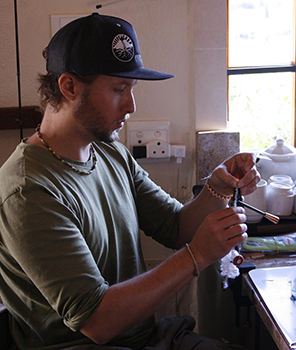 Gavin is based in Kensignton, Johannesburg and can paint anything related to the world of angling. There has been a huge amount of interest in Gavin’s work and painting ability and he has been the subject of many blog posts (Including a post on the Orvis website), articles and reviews, and Vegabond Fly Magazine has done a video interview with him, which can be seen below this article. The South African Artist Magazine recently did an article on Gavin and his paintings. A truly world class artist that specializes in the difficult field of Fish Art and Fly Fishing Art. Gavin is an entertaining guy and a superb friend and fishing partner. He is also occasionally seen drinking a Banana flavoured Mageu or cold smoking some Trout. A legend in my eyes and a big inspiration to me, and I am sure many other fishermen. Keep painting Gav, and keep up the great work! 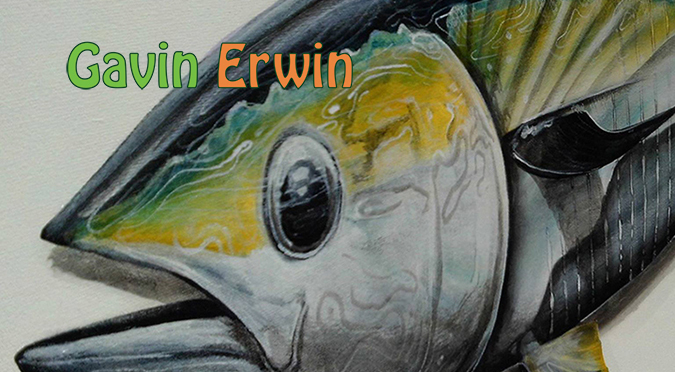 See some of Gavin Erwin’s amazing paintings, commissions and drawings here.